The crypto sphere is prone to new updates from time to change. From this standpoint, the hottest cake we have in the crypto market at present is Initial Exchange Offering. With the initial coin offering ruling the crypto enclave for the last couple of years, it is mandatory to get to know what invites IEO and how it is different from ICO at large. As an Initial Exchange Offering Development Company, SHAMLA TECH offers end-to-end IEO development services from the creation of exchange platform to token development. Hire our enthusiastic developers to avail professional assistance at every step of your IEO project. An Initial Exchange Offering is nothing but a token sale based on crypto exchanges. IEO works on various cryptocurrency exchanges; creates a platform for the developers to show up and sell the projects to the crypto investors across the globe. Before the token sale, the exchange team and the project team will draw to an agreement. The exchange platform reviews the project with a pre-defined set of terms and conditions in order to verify the authenticity of the project. If everything goes well, the platform sets a date marking the beginning of the token sale. In case the corresponding exchange holds a token of its own, the investors should buy the subsequent token to take part in IEO. An initial exchange offering is easily tradable in comparison with ICO and that too within a short span of time. In this regard, an initial exchange offering can stimulate a majority of the stock markets to take part in fundraising. It advocates a decentralized and authoritative fundraising model. On the ICO becomes an easy target for scams with every passing day. In the case of ICO, the tokes are issued to the investors once the fundraising is over. However, in the case of IEO, the projects mint tokens and send the same to the exchange platform. In short, IEO is more commendable than ICO in a number of ways. When you plan to begin an initial exchange offering, take legal counseling in order to understand the regulatory demands of your new venture. Take the help of the best IEO service provider around to take complete charge of your project. 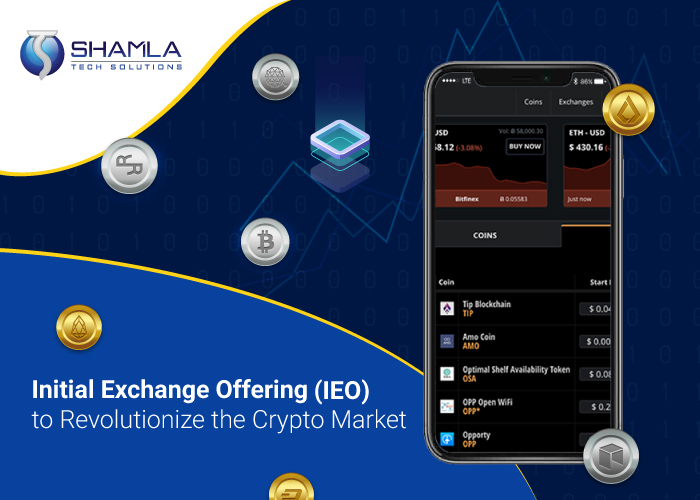 Being a professional initial exchange offering Development Company, SHAMLA TECH provides the clients with world-class services contributing to a massive IEO raise.